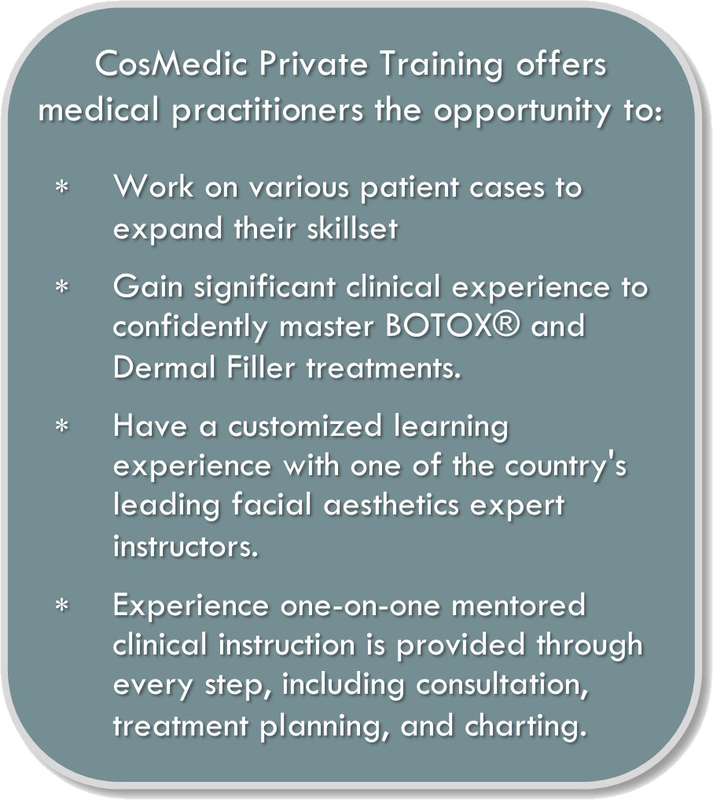 Private Botox and Dermal Filler training is an appealing option for professionals looking to complete a one-on-one comprehensive training or build on the skills learned throughout the C1 and C2 courses. During private training, practitioners will expand their knowledge and gain clinical experience to further expand and develop the use of Botox and Dermal Fillers in their practices. Private training allows for a personalized approach and experience with one of the country's leading facial aesthetics trainers. One-on-one mentored instruction is provided throughout the planning process and during patient treatments enabling you to have all your questions answered along the way. Individualized attention offers an exclusive experience in the privacy and convenience of your own practice or at one of our training practices. Private training is an affordable and flexible option to accommodate busy schedules or attendees from various countries. Private Training Schedule: In the morning, the instructor will cover the didactic lecture material in depth and answer any questions you may have. Following the lecture, you will be assisted in treatment diagnosing and treating several patients for the remainder of the day. Tuition: Please click here to contact us directly for more information on pricing. In addition to individual private training, we offer private group training (1-7 doctors) and two-day private group training (8 or more doctors). Comprehensive training manual with complete, colored presentation slides on both Botox & Dermal Fillers. Also includes Patient consent forms, facial mapping charts, case studies, etc.